Biasing your KSR amp is easy, all you need is a simple voltmeter capable of reading DC mV (basically any meter will do). Remove the back cover via the (4) #2 Phillips screws in order to access the Bias control on the top-right side of the chassis. Or, for Artemis, remove the top cover via the (6) 6-32 screws on the sides, and (2) 4-40 screws on the top front. Set DMM to DC mV, or simply DC V if it is an auto-ranging meter. Plug the black DMM probe into the Black Bias Test Point. Plug the red DMM probe into the Left Pair – Red Bias Test Point. Turn the amp global master volume all the way down (off). Ensure a proper load is connected to the Speaker Output and the impedance selector matches the load. Turn on the amp via the Power On. After a 60 second warm-up, flip the Standby switch to Play. Check the mV reading on the DMM. 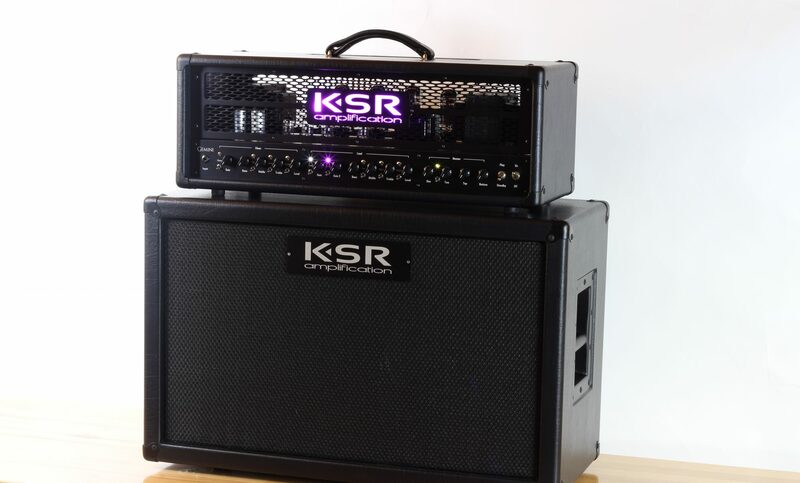 100W: For a 6L6GC loaded amp it should be between 50 and 60 mV, which is equivalent to 50 – 60 mA per pair of tubes. This is the equivalent to 25-30 mA per tube. Amps are setup at the factory at 50 mA per pair, however it is safe to run up to 80 mA per pair. 50W: For a 6L6GC loaded amp it should be between 25 and 30 mV, which is equivalent to 25 – 30 mA per tube. Amps are setup at the factory at 25 mA per tube, however it is safe to run up to 40 mA per tube. While watching the DMM, adjust the bias setting with the Bias control on the top right side of the chassis. Counterclockwise rotation lowers the bias, clockwise increases. For a tighter sound, use a lower bias setting. For a more saturated sound, use a higher bias setting. Take note of the Left Pair reading, then plug the red DMM probe into the Right Pair – Red Bias Test Point. Compare the Right Pair reading with the Left Pair – they should be within ~5 mA of each other. Note: If you see strange numbers such as, one side is 0 mA and the other looks good, both tubes on one side are out. If one side reads about half of the other, then just one tube is out. If the two readings are close, just not within ~5 mA, then the tubes are not properly matched and should be replaced. One can also swap one tube from each side in order to try and balance the readings more.